Adobe has a long and and proud association with the Macintosh platform. It licensed Postscript to Apple for the original LaserWriter, and so ushered in the DTP age through the Mac. Its first software product was Adobe Illustrator for the Macintosh, and Photoshop has long been the choice of creative professionals on Apple hardware. Of course, Adobe is also responsible for the Portable Document Format – as its name applies, a cross-platform file format that ensures that documents always look as intended. Adobe Reader is the free reader software that enables these documents to be seen, but creating PDF documents has not always been as easy. Acrobat is the Adobe solution to that problem, and in days gone past pure PDF creation was really all it was about. Time has moved on, of course, and any modern Mac running OS X can create PDFs without blinking, and read them using the in-built Preview application. Given this, Adobe’s Acrobat has to offer substantially more than simple PDF creation in order to persuade a Mac user to pay good money for it. Adobe Acrobat 9.0 is the latest version (I was looking at the Professional variant – Standard is also available), and once you fire it up it is clear that Adobe has embraced the challenge of adding value with relish. A clean interface provides a series of drop-down buttons for the Acrobat workflow – starting with creation of new documents, and ending with commenting of existing PDFs. PDFs can be created from pretty much any source – files, clipboard images, or web pages/sites. There is a screen capture engine and a TWAIN scanner interface as well, and even a limited word processing system, and a batch/combining tool allows disparate documents to be assembled into a single PDF. PDFs can be tagged, bookmarked and indexed, as well as having security added to the user’s specification. This is all as expected – a refined tool for creating finely crafted PDF documents. And Acrobat has had most of these abilities for some time. New in version 9 are a variety of features aimed at making the PDF format more than just a documenting engine. You could always easily combine multiple PDFs into a single document, or even combine separate documents into a PDF ‘folder’, but with this version you can create a new PDF container called a Portfolio. This allows the separate constituent documents to be presented as a parts of a Flash-based interactive menu structure. It actually looks a lot like the effects you can get with iPhoto galleries on MobileMe, but the included documents can be any format that Acrobat supports for import. That function leverages the new media features supported now in the PDF format. Any video or audio file can be imported and embedded into a PDF, and it is converted on the fly into a Flash video for presentation within the document. This is a really clever move, as it offers a simpler way to Flash video handling than with Adobe’s other Flash-supporting products. 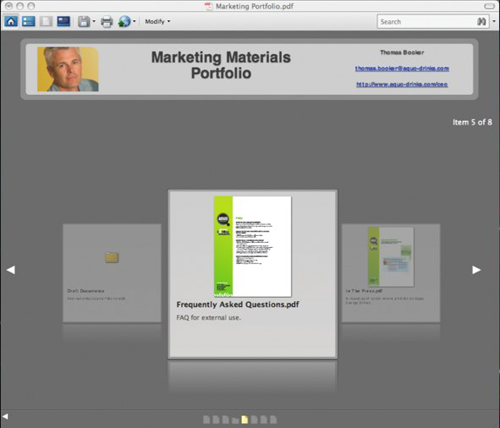 Adobe now has on online presence with a site at Acrobat.com, and this is used as a central repository for uploading, storing and sharing PDF documents. Acrobat has been able to share PDFs for commenting and amendment for a couple of versions now, but the integration of the online site as a repository for doing this makes a lot of sense. The overall online integration extends to an online collaboration engine with screen sharing, a full meeting space webinar engine, and even integration with Safari such that PDF links clicked on the web are loaded more efficiently and have the PDF toolsets presented from within the browser window. A point to note about all of these new functions is that users will need Adobe Reader 9 or Acrobat to access them if they get PDFs created in Acrobat 9. 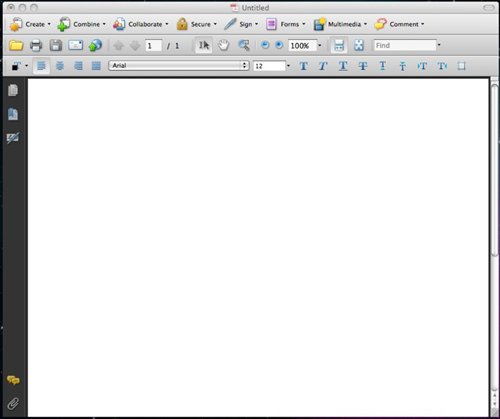 Acrobat users can use the program as a super PDF reader, but annoyingly even with Acrobat installed Adobe does not supply Quick View filters or a Preview plug-in for OS X 10.5 Leopard, so without Adobe software to view the documents you will just see a large flag page pointing you to Reader 9. Further enhancements have been made by Adobe to Acrobat in the areas of form creation and pre-press functions. These are the professional features that, if they fit within the niche profile of your business, make the purchase of Acrobat a no-brainer, and will probably drive you to upgrade to each version as it is released. However, the question of value becomes a real consideration for the rest of us. The issue is that Acrobat Professional, good as it is (and yes, in my opinion it is very good) is pretty expensive at $449. There are other Mac products that build on the PDF handling within OS X, and offer much of the functionality in Acrobat at a fraction of the price. And, as a user here in the UK, I was dismayed to find that Adobe’s pricing policy bring in the UK price at £499 – a little over $900 at today’s exchange rate. Even allowing for sales tax variations, the UK price is nearly double that of the US, and when I queried it Adobe told me “There are two primary influences on pricing: the cost of doing business, and customer research that assesses the value of the product in the local market.” That second comment about customer research makes me a little uncomfortable, as I can’t really understand in a global market how that should change the pricing so much. Now, that said there is the cheaper version, Acrobat Standard, that loses some of the pre-press and video functions, so take a look at the features list and the trial versions if you think Acrobat might be for you. As I said, it is an excellent program, but I do have to knock the rating down on the pricing for those who pay the bill themselves.